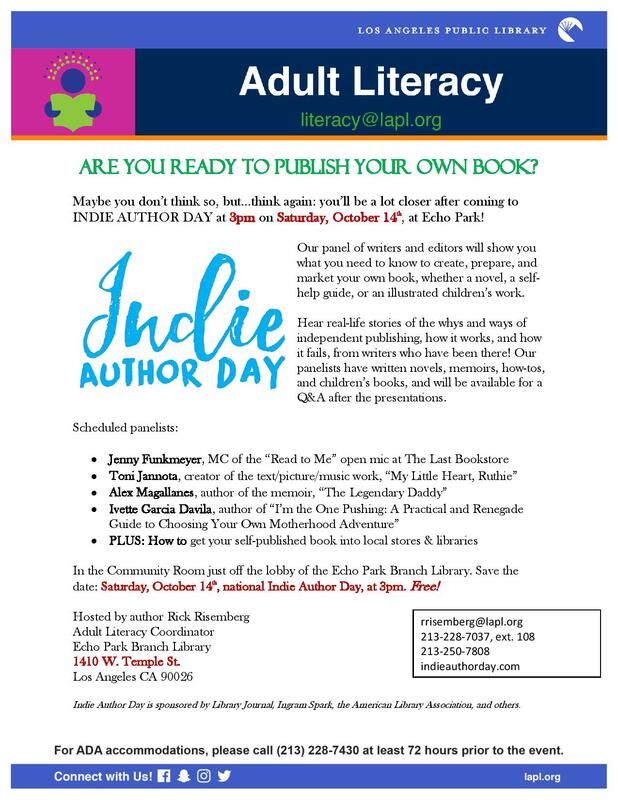 If you live in or near Los Angeles, consider attending the Indie Author Day event I am hosting at the Echo Park Branch Library on October 14th. Indie Author Day celebrates the self-published author, and is sponsored nationwide by Library Journal, Ingram Spark, the American Library Association, and many others. I’ve nagged a number of fellow independently-published authors to serve on a panel discussing the ways and means of writing, editing, preparing, and marketing a book, including illustrated and multi-media works. There will be a Q&A after the presentations. There is no charge to attend; just show up and learn! Details on the flyer in the image, which I encourage you to print and pass around, or forward to your own social media streams.